Yukoners who rely on minimum wage earn $11.51 per hour. And that’s before any tax comes off the top. Yukon workers deserve better than minimum wage – they need a living wage. Most minimum wage discussions tend to go down the path of cost, instead of decency. Let’s take a quick look at the cost side so we can better understand the argument for decency. Let’s envision a worker putting in 60 hours a week at two different minimum wage employers (with no overtime). At the current minimum wage, and after taxes, their take home is just under $33,000 a year. Let that sink in for a moment. Given the recent rent survey completed by Yukon Bureau of Statistics, let’s assume our worker is single and pays the average rent for all types of rental units, $1,184.00 per month. Over a year, that total comes to $14,208.00. Nearly half of our worker’s income is gone in rent. I could go on, but I imagine folks can predict where this math leads. Come year-end, a worker with one full-time and one half-time job has been able to little more than meet their survival costs. The decent alternative to the minimum wage is a LIVING WAGE. In Yukon, a living wage is calculated as $18.26 per hour – a substantial jump from the $11.51/hr minimum wage. This figure takes into account the true cost of living in the north, factoring in the high rents, higher cost of living and realities of the northern economy. The minimum wage was introduced in 1975 to prevent the exploitation of women and youth in the workplace. Over time and in practice, minimum wage has served to do the opposite. Most minimum wage positions are now occupied by adults, especially people of colour and new Canadians. Minimum wage earners often support families, working two or more jobs to do so. The living wage is designed to lift individuals and families out of poverty and into a place of greater economic security. Times have changed since 1975. Business interests have formed powerful lobby groups which are often given the same or greater rights as people. What has been lost along the way is the understanding that businesses exist to meet the needs of the people. If people can’t afford the costs of goods or services, then businesses will starve and die. Making decisions on how much people should earn based on the cost to business, is indecent. Providing workers with a decent income will result in greater financial freedom, and increased spending on goods and services. People who aren’t on the knife’s edge of poverty have a much better quality of life, lowering costs for our health care system. The benefits to our communities would be many, and the businesses paying higher wages would benefit from a stronger economy – the positive effects of increased wages have consistently proven to outweigh the costs. It’s time for Yukon government to make the decent choice, and support low-wage earning Yukoners. Read the letter to Yukon Premier Sandy Silver sent by Northern Labour leaders. Strike Vote, Recession & the 9 Day Fortnight. Yukon’s economy was in free fall in 1982. The hard rock mining industry had collapsed, mines were shuttered and the territory slid into recession. Hundreds were out of work and recovery looked bleak. It was against that evolving backdrop that the negotiating team of the YTPSA met with the Yukon Territorial Government in early 1982. Still battling wage disparity and the high cost of living in the north, YTPSA opened salary negotiations with an 18% pay raise demand. This was met with a resounding NO by the government who offered 13.5% and no more. The union and employer battled it out at the table but reached impasse when the government’s offer was rejected by the union. Internal conflict within the Union saw the resignation of 2 of 3 YTPSA bargaining team members. 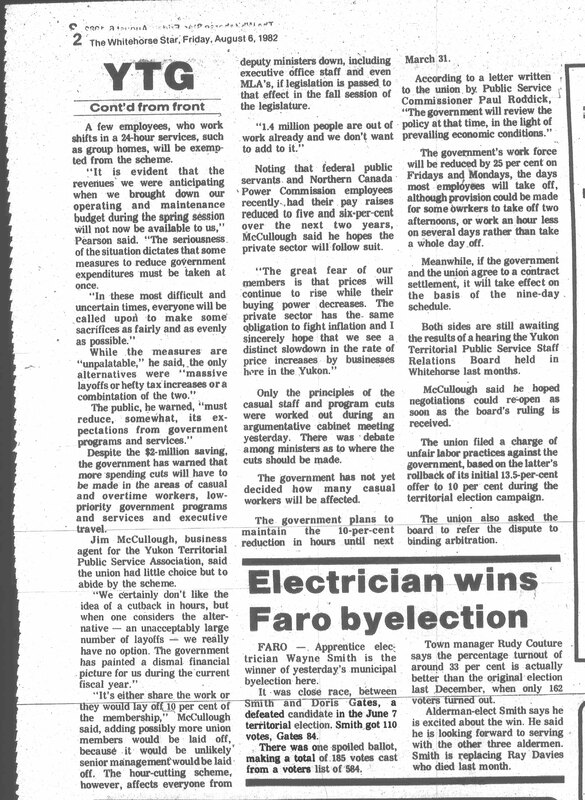 In May of 1982, Government leader Chris Pearson withdrew the salary offer and chided the union for its attempt to “insulate public servants from the economic environment which provides their livelihood”. Following the decision of a conciliation board, the Union recommended ratification of a contract containing an increase of 10.2%. A territory wide ratification tour followed, and the ballot boxes returned to Whitehorse to be counted. But while the union was getting the contract ratified, the politicians refused to accept the conciliator’s recommendations. No deal. YTPSA didn’t bother opening the ballot boxes. Instead, they grabbed new ballot boxes and hit the road again. This time though, they were looking for a strike mandate; they got it – over 80% of the membership voted in favour of a strike. When they returned to Whitehorse, strike vote in hand, both sides met again at the bargaining table. This time they agreed on a 10% raise and the deal was signed. Meanwhile, the economic realities of a territory without a hard rock mining industry could not be ignored. Soon after the contract was signed, the landscape shifted again. Government leader Chris Pearson rose in the legislature to say “Mr. Speaker, Honourable Members, the current economic recession is having an impact on Yukon and its people far beyond anything that could have been foreseen six months ago. The closure of the United Keno Hill mine at Elsa in combination with the closures already announced at Whitehorse Copper and Cyprus Anvil constitute a disaster to the Yukon economy as well as to the mining personnel themselves and their immediate communities. It will be no surprise, therefore, that the Government of Yukon has found it necessary to undertake a program of retrenchment in order to bring our spending plans in line with the financial resources available”. 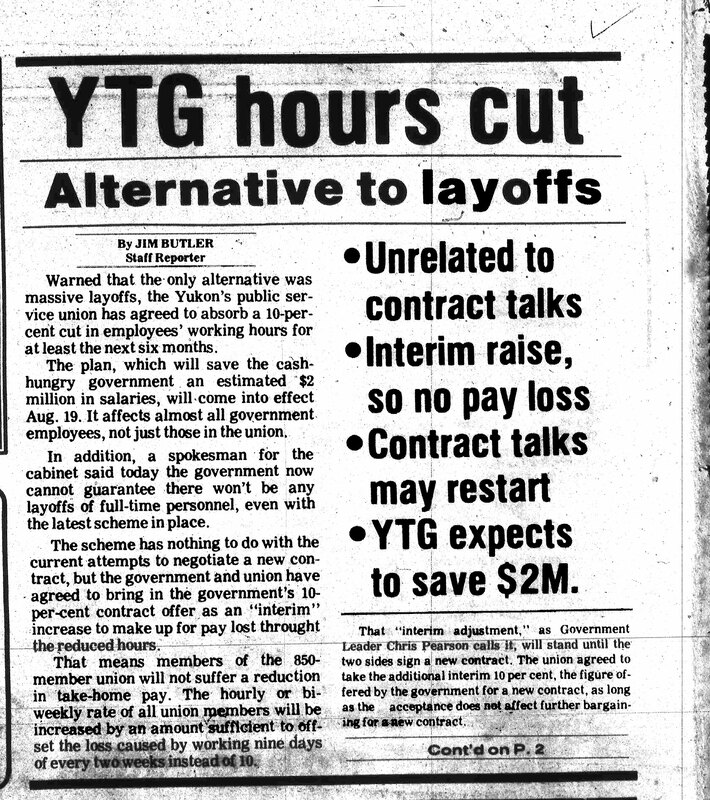 On August 6, 1982 Pearson announced that the Yukon’s Public Service Union had agreed to the government’s proposal, cutting civil servant’s working hours by 10% as a cost-cutting measure. This cut would be in effect until March 31,‘83 and could save the government $2 million. Pearson’s “9 day fortnight” program was clever; the pay increase was cancelled out by the reduction in hours worked. YG’s Main Administration building and other administrative offices shut down every second Friday. Thus, most employees’ pay cheques remained unchanged while they enjoyed a long weekend every other week. The union faced little choice; cut backs or lay offs, the government needed to cut costs. Our thanks to the Yukon Archives for Whitehorse Star records and to past President Dave Hobbis for his recollections of this interesting period in YEU’s history.